Animals have a secret unknown to humans — conversations with Arabelle. We learn that Arabelle has a sense of humor. 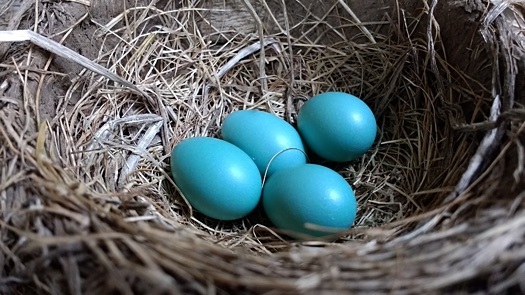 Rebecca Robin is nesting on her tiny blue eggs and talking with Arabelle. "Four eggs! That means four hungry babies. I'm glad Roger Robin will be helping. It would be too much just by myself. That's a lot of worms to find!" Just then, the cat named Misser wanders into view. Rebecca Robin flies high into the tree, feathers aflutter, chirping her warnings to Roger and all the birds in the woods. Arabelle floats down to Misser. "Misser, you wouldn't eat Rebecca, would you?" "Rebecca has nothing to worry about." Misser replies. "I'm an old cat and can no longer climb trees. So long as she is in her tree, I can't get close to her." Rebecca hears Misser and returns to her nest. She must keep the eggs warm so the babies inside will grow big enough to hatch. Just then, Arabelle notices someone wandering around the field near the woods. "Misser, your human is looking for you again." "He always worries — because he thinks I'm his responsibility. I'll walk into the meadow to be visible." Before he leaves, Misser has some parting words. "He keeps feeding me because I let him think he owns me. I'm too old to hunt for myself." "You know, Arabelle, he never goes near that spot by the creek where you showed yourself to him. He's actually afraid he might see you again and have to admit what he saw before was real." "Oh," says Arabelle. "You mean he's a scaredy-cat?" "If I could laugh, I would!" Misser me-ows. Then walks out of the woods and saunters toward his friend. Arabelle floats up to Rebecca Robin to resume their conversation. Use this form to send a private note to Will Bontrager, the author of Scaredy-Cat.